No bottled water - filter and reusable bottle work great! 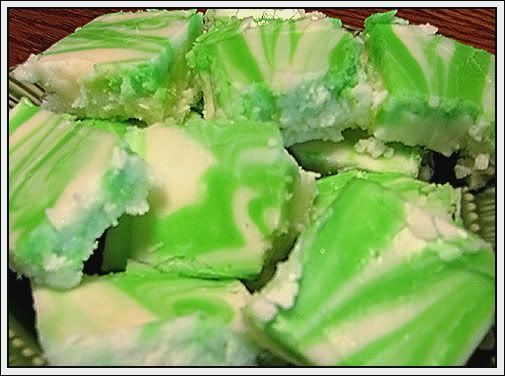 Keylime Fudge - OH MY! I changed my mind about the soap and decided to go with making fudge! Forgive the awful pic. It doesn't do the beautiful fudge justice. I was under fluorescent lights and didn't get a good focus and then my batteries went dead and all the AA batteries had been used in the boys Leapsters, so this is the best I could do! When my internet sisters were here visiting, we went to the chocolate factory and sampled and tasted and oooooo'd and ohhhh my'd over all kinds of fudge but my favorite from that day was keylime fudge! I made some peanut butter fudge using goats milk last Thursday and I would show you some pics but ummmmm, it's all gone already. I made one batch with a previous recipe I had but it wasn't as good as what I had back in August so I decided to change a few things and here's the final "make your sister-in-law extremely jealous, she'll just have to have this recipe at the Christmas dinner" keylime fudge recipe. I say that because that's what my sister-in-law Ta' did to me with her dreamsickle fudge recipe. So, it's payback time of course! (Love ya, Ta'!) 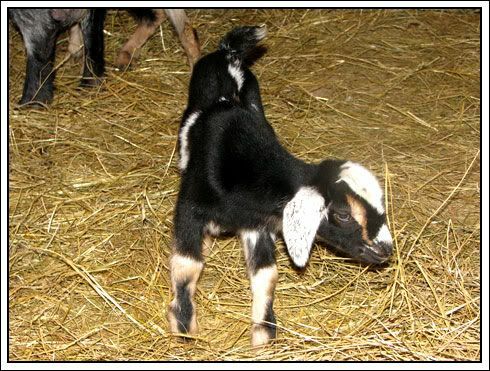 You can use evaporated milk but if you have goat's milk, PLEASE use it. I love the creamy richness it gives the fudge. 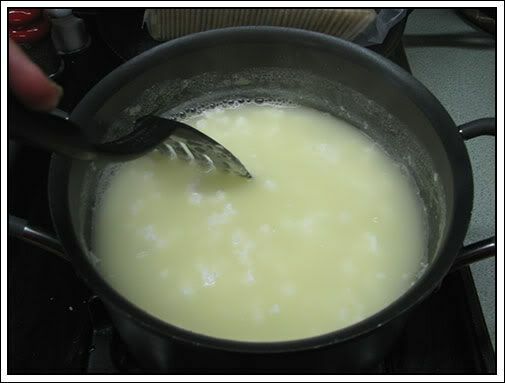 Mix milk, sugar, salt and butter in a large saucepan over med-high heat and bring to a boil. Continue boiling for 8 minutes stirring constantly or it will burn and stick. After 8 minutes, reduce heat to low and add marshmallows chocolate chips and lime extract. Turn off heat and stir until completely melted. Remove 1 cup of mixture and set aside, pour rest in a well-buttered 8 x 8 dish. Add green food coloring (a few drops) to 1 cup of mixture and stir. Pour on top of other fudge and use a butter knife to swirl it and give it a marbled effect. Place in refrigerator to cool. 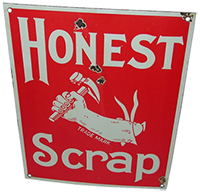 When hardened, cut into 1 inch pieces and ENJOY! The first recipe I tried was with lime zest and lime juice. I just couldn't get that "keylime" tartness and I couldn't find extract in the store so I bought an 8 oz. bottle online and it's worth every penny I paid! I plan on making this and Ta's dreamsickle fudge (and maybe a few other kinds) and wrapping some up in cute boxes and giving them to the girls at the clinic for Christmas. 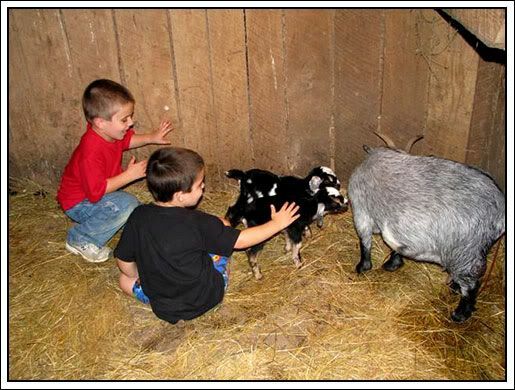 When Nellie lost her baby we decided to go ahead and milk her to see if we liked goat milk, goat cheese, etc. and if it was worth the time and effort of all that was involved. We've been milking Nellie for a couple of weeks now and plan to continue. We are getting 2 quarts a day, not bad for a pygmy. My husband, who is very lactose intolerant can once again drink milk! We pasteurize it before drinking, some people don't but we prefer to. Besides drinking the milk, we've also been making cheese and it's delicious! We had only made cheese seasoned with kosher salt and pepper before today so I decided to venture out a bit and add some basil. I am hoping I like it since I just used 2 quarts of milk to make it. After doing some internet research, here is the method we use. 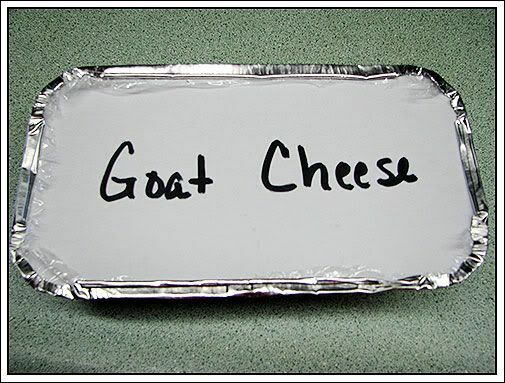 It's really easy and can be made with bought goats milk if you do not have access to fresh goat's milk. Measure out your ingredients so you have them ready. 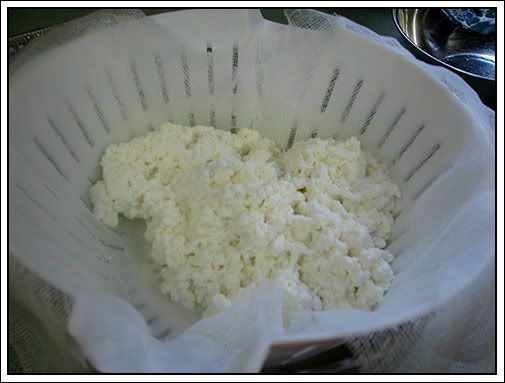 Set your colander with cheese cloth over a large bowl to catch your whey when straining the cheese curds. I use 2 layers of cheese cloth at a time. 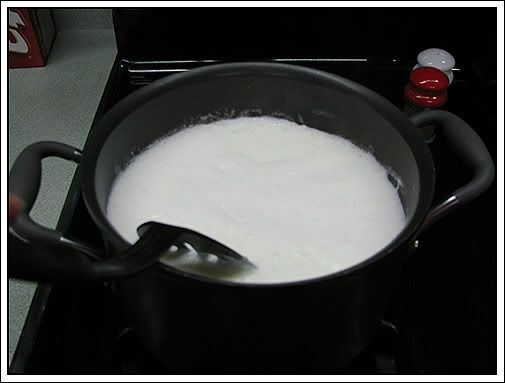 Put your goat milk on the stove over med/high heat in a large pot. 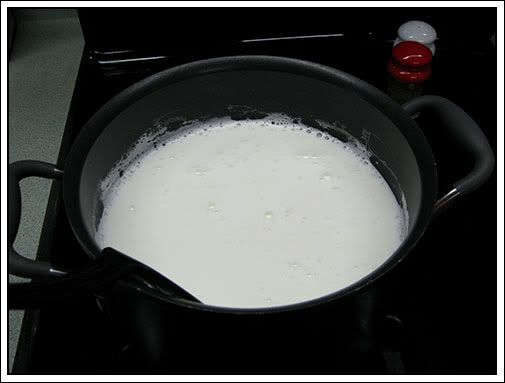 Make sure to stir continuously so the milk does not stick in the bottom of the pan. This gives the cheese a scorched taste. 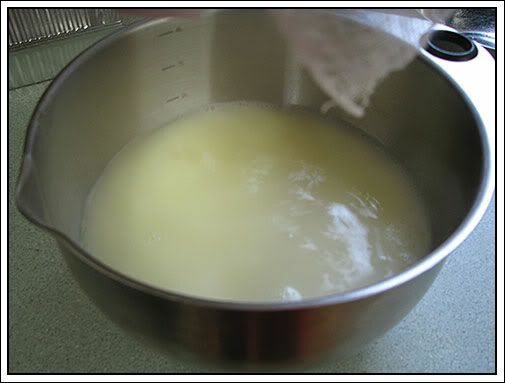 This is the separation of whey and curds. Continue stirring for about 30 seconds and then pour into your strainer. There's your cheese! and what you have left in the bowl underneath is the whey. I have been discarding this but recently read that it can be used in sourdough bread starter and other recipes. I'll have to look into this a bit more! 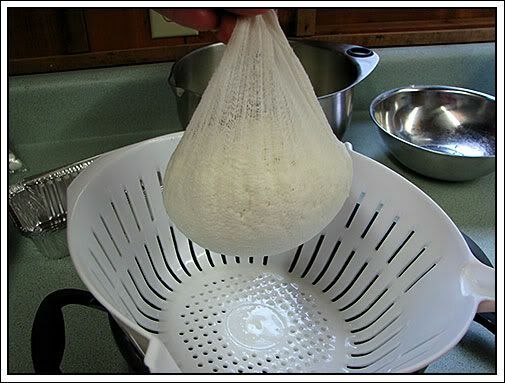 Twist the top of your cheese cloth tightly to squeeze out the remaining whey. I like to press the bag against the side of my colander with a large spoon to help squeeze out the leftover whey. 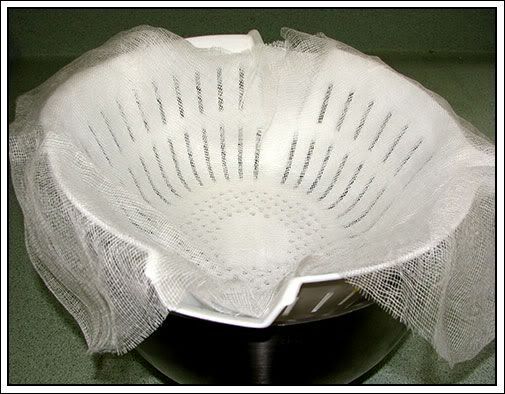 If you like a dry cheese you can hang the cheesecloth this way and let it drip overnight. 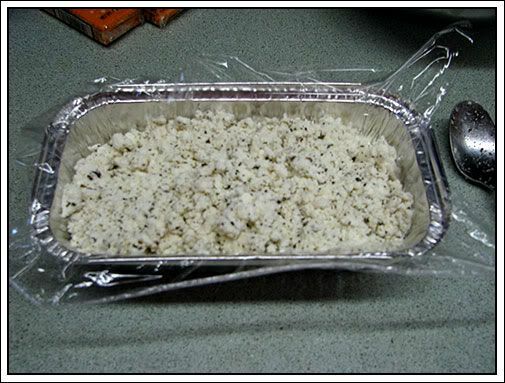 You will have a drier, more crumbly cheese like feta or Parmesan. Pour your curds into a bowl and add your seasonings. I am in love with just the salt and pepper version, I am hoping I like the basil too! Mix your cheese well and press into a mold or bowl. I am using these small, cheap loaf pans to press mine into. Store your cheese in the refrigerator for at least 2 days before tasting. Letting it sit out and reach room temp right before serving will bring out the most flavor but I prefer mine cold. Go get some goats milk and try it! 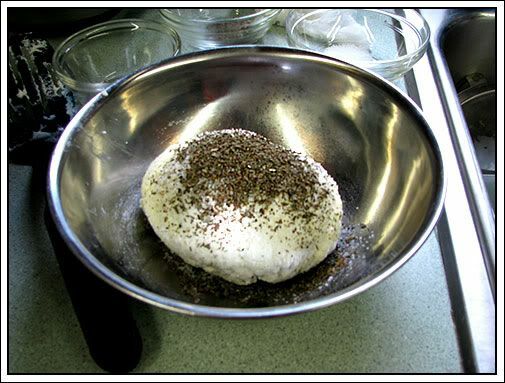 There are lots of recipes online that use goat's cheese. I'm excited about trying a few of them. 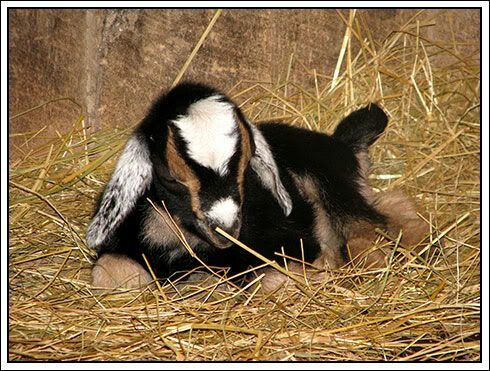 Next goat adventure....I might try making soap! This post probably comes a little late for most of you since the tomato crop has come and gone (at least around here) but I thought I would share it anyway. 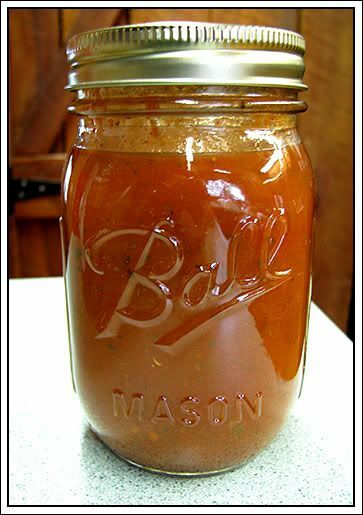 It will be in the archives for next years canning season or if you canned tomatoes this year, you can use some of those to make it now. I canned several jars of pizza sauce this year and the boys are loving the homemade pizza! I have been using Suzanne McMinn's pizza crust recipe. It's quick, easy and makes an awesome crust. The sauce? Well, I cheated a little bit, but hey, if we love the taste and it's easy then I don't see a problem with it. This made 12 pint jars of sauce. Work up your tomatoes and then add the sauce mix in a large saucepan. Add your extra basil and oregano. I find this sauce is thinner than I like for our pizzas so I slowly add a tablespoon or two of flour at a time, stir and continue doing this until it reached the thickness we like. Follow the directions on the pizza sauce package for how many tomatoes and the time for cooking. I would tell you but I used all my packages! Pour into clean, hot jars, adjust lids and bands and process in hot water bath for the time recommended by Mrs. Wages also makes an awesome salsa mix that I add a few things to (green peppers, jalapenos, spices, brown sugar, etc.) I have people come to my house just to take jars of my (and Mrs. Wages) salsa home with them. So, if your in the mood to try your own pizza sauce...go for it. This is an easy one to start with. Maybe I'll branch out and try to invent my own some day....Kentucky Farm Girls Pizza Sauce hmmmmm, maybe I'll just stick with Mrs. Wages! So make Suzanne's crust, slather on some of this sauce, lots of fresh veggies and pepperoni or whatever you like, mozzarella cheese (or better yet, goat cheese which we have been making, will post about that later.) We made pineapple and Canadian bacon pizzas a few nights ago and they were so good. I look forward to having pizza this winter without having to drive 12 miles to get to the nearest pizza place! When I walk outside with my husband and Jake in the mornings to tell them goodbye for the day I always see something that needs its picture taken. 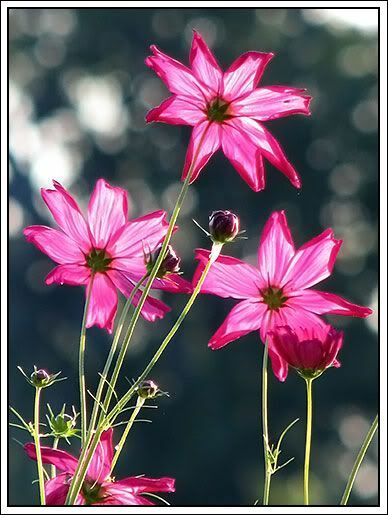 The sun had just made it's way up over the trees that line our property and these pretty pink gals were soaking it up! 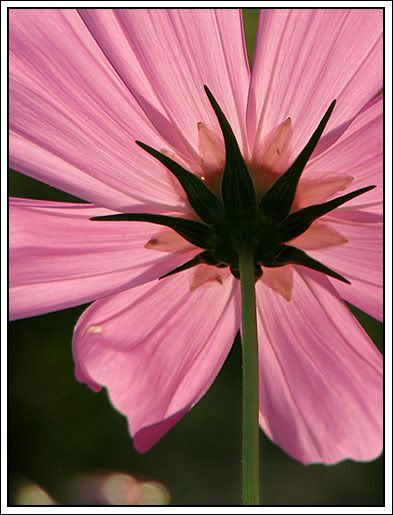 These were taken from the backside of the flower, looking into the sun. 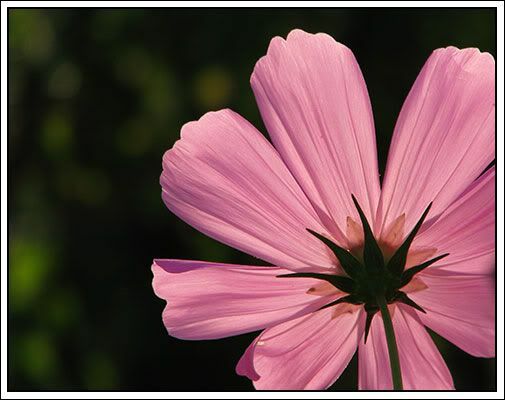 I love pink! Blue is my favorite color on most days but today it is pink! No one ever said you couldn't change your favorite color from day to day! Hello beautiful pink lovelies! 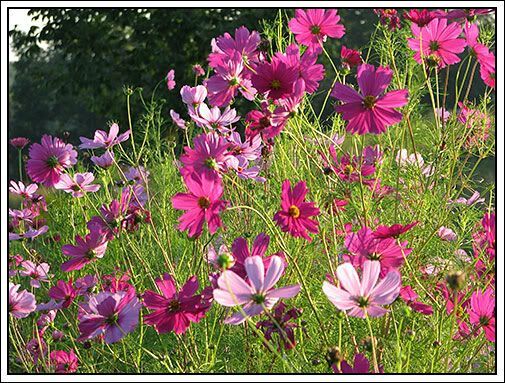 I will be collecting seeds so I can bring these beauties back to life again next year! But just so blue doesn't get jealous! 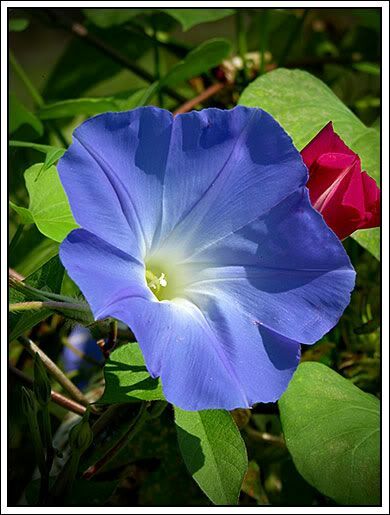 I hope your day is as beautiful as flowers in morning sunshine! when you have this guy waking you up every morning! Of course, he has to make sure that everyone knows HE'S THE MAN! He has to take care of this group of wild and misbehavin' ladies. 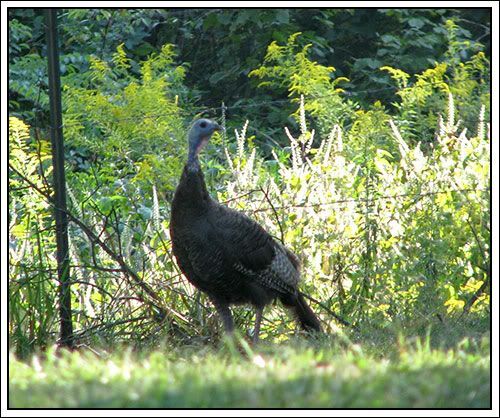 Unless he can talk Hoppy, our one-legged wild turkey hen, into helping him teach these ladies how to act. Hoppy has 2 legs but one is injured and she doesn't use it at all. She started coming to the barn to eat a couple of months ago, hanging in the outskirts waiting for me to toss her a handful of corn. Now she joins right in and eats just like the chickens do. Speaking of the chickens....they act like they think I have something for them to eat. Well maybe just a few apple peels. They love the leftover canning/freezing scraps and meet me halfway to the house to see what I have for them. and Hey Look! It's Dirt Cat! He's well enough to be out of his cage during the day and making his trips to the barn with me. I still put him up at night in case any neighboring Tom's are on the prowl and looking for someone to pick on. 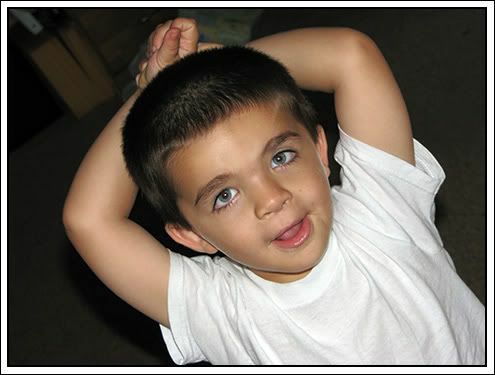 He still has the head tilt but it's supposed to be the last symptom to go away at around 3 weeks. We still have a week to go. 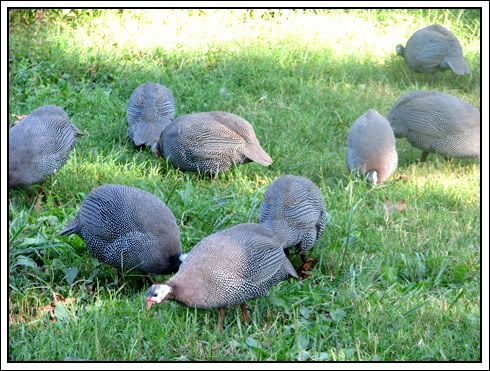 I moved the 17 young guineas from the brooder to their larger coop at the barn. I don't know if I can handle the noise of 17 more of these guys. I may see if I can find some new homes for them. Thanks for taking our morning walk to the barn with us! Let me introduce you to sweet little LUCY! and curious little MARV (named by my 3 year-old). He said, "Yes, Momma, like Erf, Marv and Jupiter!" Hmmmm, I think he's been playing his Wall-E Leapster game again! So there you have it....Lucy and Marv. Even this little guy approved. He kept poking his head out and checking out the new babies the night they were born. I think he was making sure they were no more kittens involved! I make 2 skillets of cornbread for this recipe. You can bake it in a metal or glass pan but I like using my cast iron skillet. Go ahead and put your chicken on to boil in quite a bit of water and a little salt to make your chicken broth. I use a whole chicken, cut up. Make your cornbread. Here's the recipe I use for 1 skillet (double it for dressing). Preheat oven to 450 degrees. Mix all ingredients and pour into well-greased skillet or pan. Bake at 450 degrees for 20 to 25 minutes until golden brown. Set cornbread aside to cool. In a large bowl, crumble your cornbread, add chopped onion and eggs. 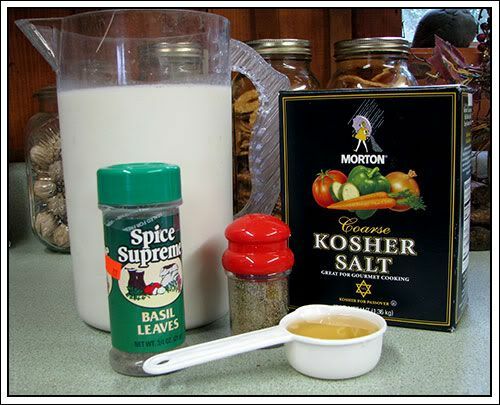 Pour in chicken broth 2 cups at a time and mix. Continue adding broth until moist. Let sit a bit so the cornbread will soak up the broth and then add a little more. You don't want it too dry. When you get it good and moist, add a little more broth, you want it almost like a really thick soup because it will dry out some during baking, start adding your sage. I was using fresh sage and used 2 handfuls of chopped leaves. That wasn't enough for us (my husband was doing the tasting) so I added another teaspoon of dried sage. 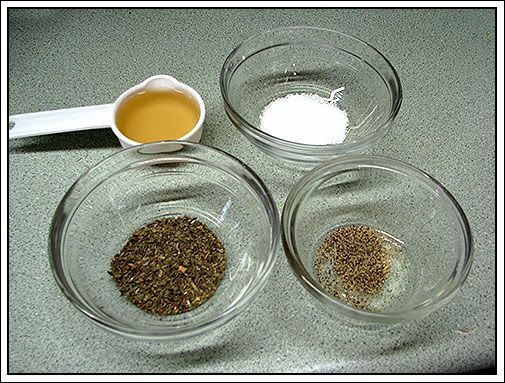 Mix well, add a little salt and pepper, pour into a large baking dish and bake in a 350 degree oven for about 30 minutes. Serve with chicken. I was eating a plate of this all warmed up while I typed this...yum! Now I'm going to have me a Sister Schubert roll with some apple jelly. or you'll miss it! That's how fast Miss Nanny had these two little adorable snuggle bumpkins! I checked her at 2:30, came to the house to work for a bit and went back to check her at 3:45. As I was walking into the barn, I heard a baby. They were here, all cleaned up and nursing! They look just like their Daddy! Nellie didn't want anything to do with these babies and Nanny is so proud of them. Miss Nellie will get her turn next time. I'm sure she'll enjoy being around these two as they grow up. I called my husband and told him to tell the boys to come on out to the barn when they got home. I am pretty sure they like them. What do you think? I think Luke was so excited he just sat right down in the goat poop! Maybe just a little bit. Luke wanted to bring them to the house to sleep with him! We got a boy and a girl! Look at that sweet little face! I could just love on them all day long! I want to bring them to the house too!! We had T.R.A.S.H. (Totally Radical About Serving Him) Children's Crusade at church tonight and I still have some typing for work to do so I'll post that dressing recipe tomorrow! Oh my where do I start? First of all the prizes were mailed yesterday so go stand by your mailboxes ladies!!! 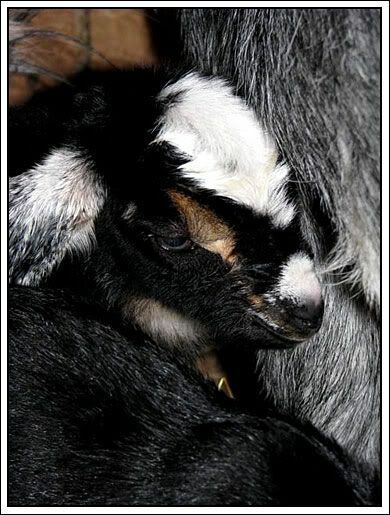 We were expecting baby goats this week and Nellie went into labor on Tuesday afternoon. Despite lots of help and trying to save the little guy, he came nose first with his legs tucked under neath him. With those long Nubian legs, I just couldn't get him positioned right no matter how hard I tried and we lost him. We did what we had to do to save the momma and she is on the mend. Of course, I cried off and on for the next 2 days. I had really been anticipating this little baby because it would have been Nellie's first since we got her. It's all part of farm life but it's still so sad! Nanny looks like she's about to pop and having pains one after another. I won't be surprised if she has 3! I was up 3 different times making the trek to the barn to check on her during the night and she still hasn't had anything. 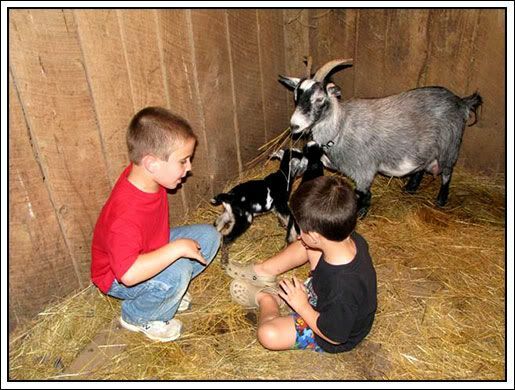 I talked to one of the local goat breeders and he said that if I left them in the stall together and Nanny had more than one, that Nellie might accept one of Nannies. We're still milking her and we're going to try that. I won't push it but if it happens then I know both (or all 3) of the babies will get plenty of milk. I promise pics as soon as she decides she's ready to share those babies with us. Last weekend was packed with 2 different birthday parties, open house for kindergarten, my husbands family came to visit from Nashville on Sunday and then we took the boys across the ferry for a picnic and some cave touring at Cave-In-Rock, Illinois. I hope you all had a wonderful holiday. They loved the ferry ride. I have pics but they haven't been downloaded from my camera yet. 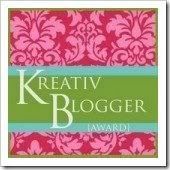 I am a blog slacker!! I am so sorry. 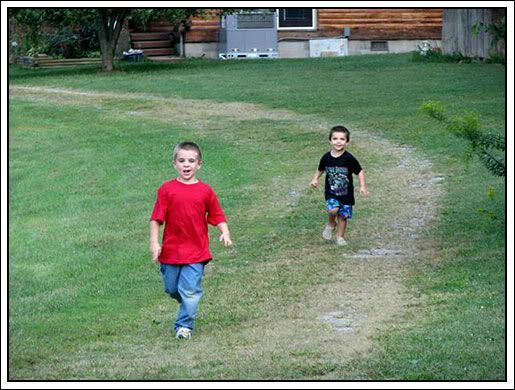 Oh and the bee sting.....Jake was climbing the gate at the barn and of course I said, get down before you fall boy....he listened to his momma, turned around and a red wasp popped him right on the cheek. We know he's not allergic to wasps now. It turned a little red and hurt for awhile, now it's all itchy but he thinks he's super tough because he got stung right on the face.....BOYS! That's the update around here. I'll dig around here and see if I can find a recipe to post. I made chicken and dressing for the first time last night. I always rely on my mom to make it because her's is so good but I had a lot of dried sage from my little herb garden this year and decided to make some. I called and got her recipe and she and my Dad showed up for supper. We had chicken and dressing, baked beans, corn on the cob and apple pie....yum!!!! I'll post the dressing recipe a little later. Ill get these mailed out soon! Please email me with your addresses. 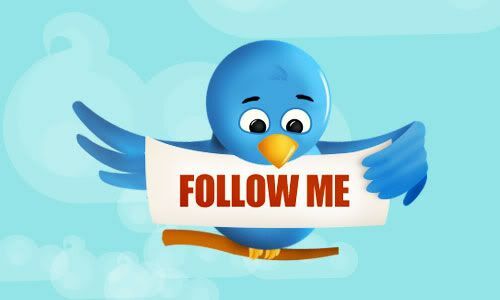 You can send them to me through the "contact me" link on the right sidebar! 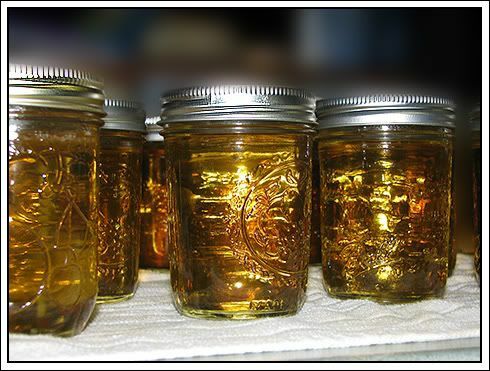 I think apple jelly has to be one of the prettiest canned items. When the light hits it just right, it glows! It's so pretty it almost poses for you! And it tastes soooo good! I love to can jellies and jams because my boys love to eat it. They love peanut butter and any kind of jelly sandwiches. Apple is one of their favorites. 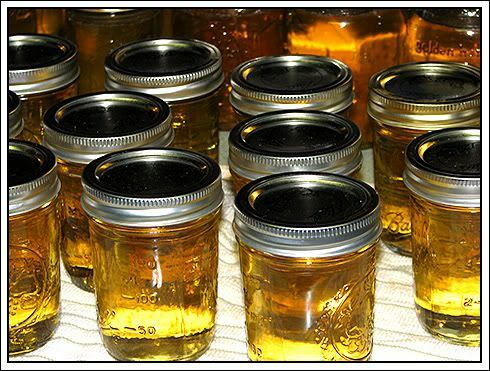 It had better be because I made 21 half pints of this golden deliciousness today! I have made this with cinnamon sticks added and others with mint but in the end we all like the plain apple best. Mmmmm, I look forward to curling up in front of the fireplace with a piece of homemade bread slathered with this and a little butter while I watch the snow fall. All the hard work in the summer is so worth it when you get to enjoy it the rest of the year! He's still very dizzy and has to be kept up so he doesn't hurt himself or something hurt him. He has improved since Monday and hopefully he will continue improving. I don't think the vet knows exactly what's wrong with him. First thought was poisoning, ruled that out and went to head injury, decided against that and said inner ear, then went to toxoplasmosis. 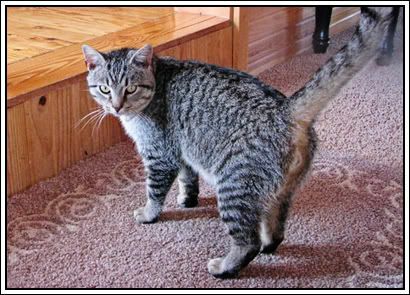 After doing my own research I think he has Feline Vestibular Disease. He has these exact symptoms so I am hoping he makes a full recovery. He is on antibiotics and Antivert for his dizziness. 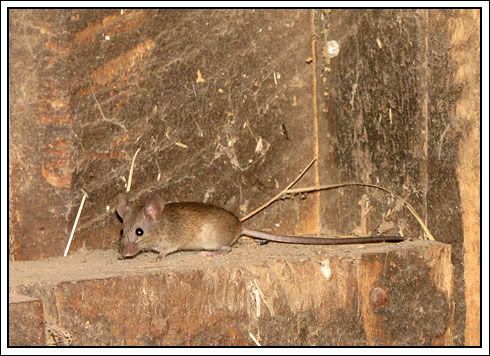 More good news: The construction guy came out last night and looked at the floor joist. He says he can repair the joists and install a new vapor barrier to stop the condensation for $600 - $700. I was thinking in the thousands and that it might involve ripping my kitchen floor out. He says it can be done from beneath so we are so happy and THANKFUL! We have open house for the kindergarten class tonight so I need to fix some supper, check on the kitty and the goats. 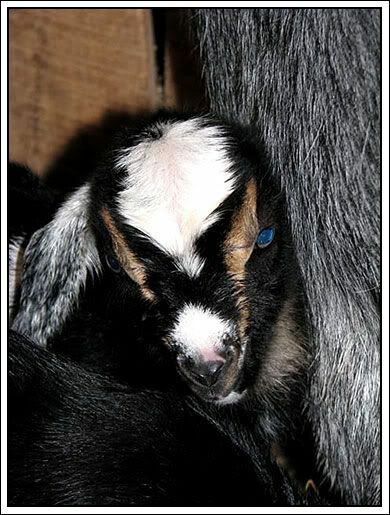 With everything else going on I forgot to mention that our baby goats are due within the next 10 days! I have them both in their stalls with fresh bedding....it's just a waiting game now. I will post pics as soon as we have new arrivals! Don't forget to check out the give away! THIS CONTEST HAS ENDED: WINNER WILL BE ANNOUNCED SHORTLY! 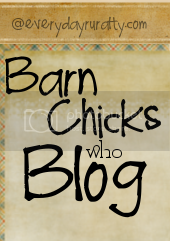 Is it a sin to blog 3 times in one day? If so then I'm bad! I am calling this my "Attitude of Gratitude" give away - thank you for the name Oakie (Arlene) - in honor of all I am thankful for plus I just like to give stuff away! It makes me feel good, so there's something in it for me too! Here it is....a little bit of Summer and a little bit of Fall! 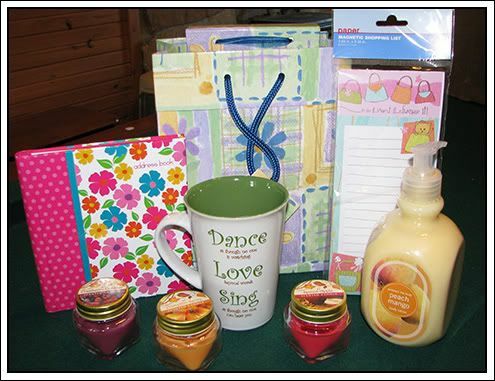 Shopping list, picture frame and album in a cute gift bag, an address book, 3 adorable little fall scented candles, some peach mango lotion and a dance, love and sing coffee mug! Tell me what you are thankful/grateful for! Blog about it and get an extra entry, just leave me an additional comment with a link to the post mentioning the give away! Contest will end a week from today, September 8 at 8:00 am Central time. Winner will be announced soon after. My edges aren't very pretty. My bottom crust needed to be a bit longer but I was in a hurry! Peel and slice apples. Soak apples in water with 1 tablespoon lemon juice to prevent darkening. Mix sugar, brown sugar, flour, cinnamon, salt and vinegar in a large bowl. Drain water off apples and mix with spices. 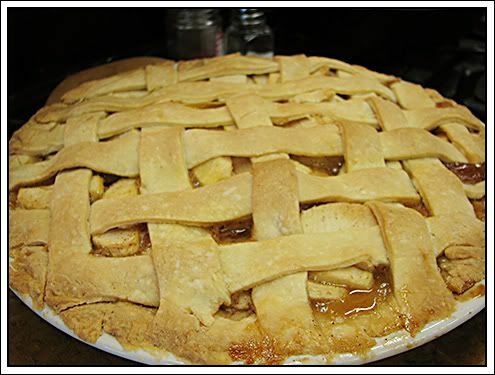 Dump apples into a 9-inch pie crust. Place about 4 chunks of butter on top of apple pie filling. Place other crust on top and seal edges. Poke a few holes in the top crust before placing in oven. (I like to do the lattice from time to time because it reminds me of my Aunt Gracie. I always loved her apple pies!) Cut a few long strips of tin foil to cover the edges of your pie to prevent them from burning. Remove these strips of foil during the last 10 to 15 minutes of baking. Bake at 400 degrees for 50 to 60 minutes. Dirt Cat is still at the vets. I called to check on him yesterday and the vet said he was thinking it was a head injury and had more tests to run but when I called this morning, he said he had started him on some meds, that he was now leaning towards an inner ear problem. We should know by this afternoon if the meds are going to have any effect. I miss him so much. I never knew how much he was a part of my day and how there are so many little things he did that reminds me of him until he's not here. In honor of a whole new day, I am having a give away! I'll be doing a separate thread for it in a little while! 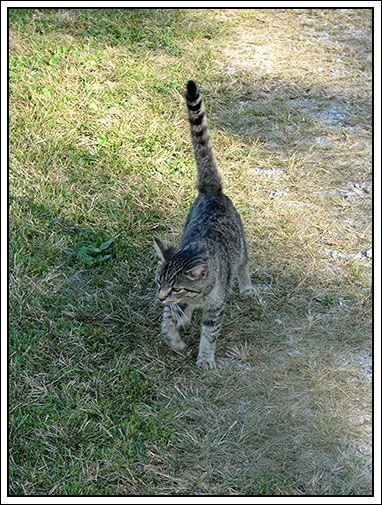 And I will spend today being thankful that in this economy we have a house to live in even if I may fall through my kitchen floor (ok, it's not that bad.....yet....and that I got Dirt Cat to the vet, he is still with us and everything that can be done is being done for him. And also being thankful for my many, many other blessings God has given me like a happy, healthy family and wonderful friends just to name a couple. There are far, far worse things in life than a few rotten floor joist. 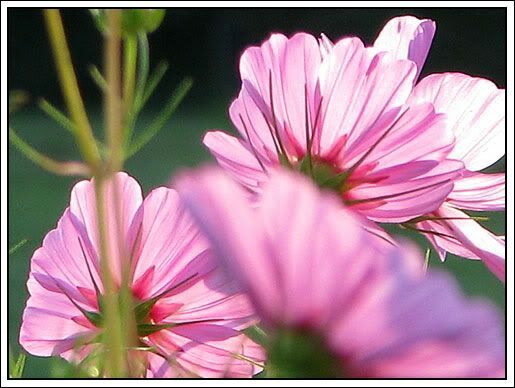 May you all have a happy day....me included! Now where did I put the rest of that pie?? For those of you who are new followers/readers, don't forget to check out the forum and join in on our discussions there. I love each and every comment my blogging friends leave for me! 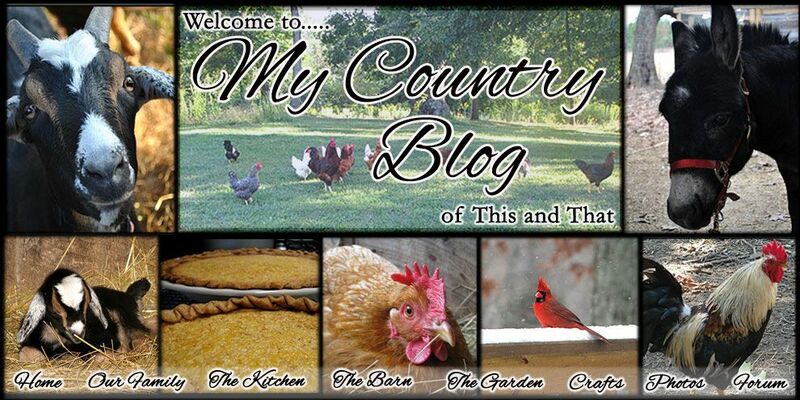 All images and graphics on this page were made by me with the exception of that little rooster! 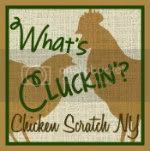 He came from Beth Logan's Checkered Chickens at pccrafter.com. Photos were taken by me and graphics were created using Photoshop CS2. If you see something you like please ask for permission before using it! 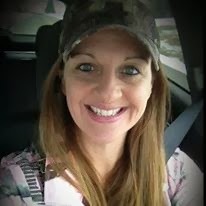 I'm a 43-year-old mom to two boys, nurse and farm girl. 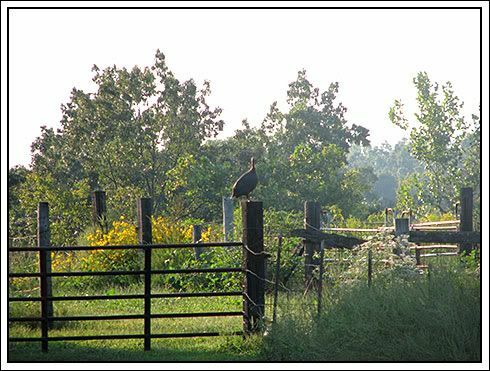 I love living out in the country and enjoying our horses, goats, chickens and all the other critters that come and go around here. Hope you enjoy reading about our life as much as we enjoy living it.